This book is a blessing for busy parents who recognise the importance of teaching children to pray, but aren't confident they know how. 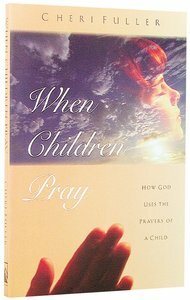 It also affirms the incredible power of children's prayers with true stories of how God has answered them. For Christian parents eager to see their children come closer to the Lord, Cheri Fuller's When Children Pray is a godsend. There's no better testament to the power and effectiveness of children's prayers than these stories of how God answers the prayers of our children and youth. Most important, this book prepares parents to teach their children how to pray -- not merely the mechanics, but understanding and claiming the power of their heavenly Father through prayer. Busy parents and those with questions about their own prayer commitments will find When Children Pray, now in an updated, contemporary cover, especially helpful in passing on a legacy of faith to the next generation.